The Quaker movement was inspired by the teachings of George Fox. In 1647, Fox began preaching publicly in fields, in town squares, and anywhere else that he could, and it didn't take long before he was attracting followers. His sermons highlighted the dangers of drinking and issues of morality and they came straight from the Bible. Fox was effective because he linked his sermons to his everyday experiences. Before long he became very politically active as he and his followers attempted to turn England into a republic. They interrupted church services across England inviting prosecution. Fox and his followers believed that they needed to challenge political hierarchy and formal churches to hasten the Second Coming of Christ and his 1,000 year Kingdom on Earth. His followers were jailed, whipped, and fined by local magistrates by the thousands because they refused to give the churches money, would not take oaths of allegiance, and insisted on publishing their unorthodox views. At the time, Fox and a few other “seekers” were known as the “Religious Society of Friends.” Inspired by George Fox's preaching they grew to number almost 50,000 members by 1680. It wasn't long before their opponents began calling them Quakers because they said they quaked from the power of God. Fox renounced formal prayers, sermons, church hierarchy, sacraments, and paid intermediaries. The Quakers believed that men and women were equal. Quakers were also among the first to denounce slavery. They sat silently until the Holy Spirit moved them to speak, as they relied on a mystical experience in their search for God. The Quakers believed that Jesus was here and now as well as eternal. Admiral William Penn was at the top of the English social hierarchy and as his son, William Jr., enjoyed a university education, a large stipend, and two huge estates that came complete with a beautiful country home. William Penn Jr. disappointed his father when he joined the Quaker movement. At the time the religion was facing extensive persecution, and it was considered a radical form of Protestantism. However, Penn was not an average Quaker. The average Quaker was a tradesman, merchant, small farmer and they distrusted the wealthy. Penn traveled across Germany, Holland, and Great Britain preaching religious tolerance. He held meetings at his estate, got his Quaker “Friends” out of jail, and defended Quakers in court. In 1680, the English crown owed the estate of Admiral William Penn approximately $30,000 dollars. The king agreed to give the William Penn Jr. 45,000 square miles in the New World in exchange for the money that was owed. In 1682, the Duke of York gave Penn the Swedish-Finnish-Dutch settlements along the Delaware River. Penn's plan for what would become the state of Pennsylvania was based on religious tolerance. He advocated for a “Free Colony,” but he did not mean free land. Land he sold for for a profit. 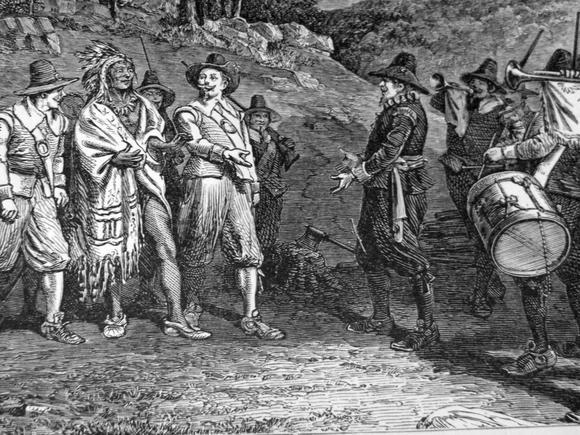 He stated, “Though I desire to extend religious freedom, yet I want some recompense for my trouble.” However, Penn was still in need of investors to share in the costs of financing the new colony. He managed to find 600 investors who were subscribed 750,000 acres for their contribution of approximately $15,000 dollars. Almost half of the investors emigrated to the new colony of Pennsylvania. During the next 4 years over 8,000 people would emigrate to Pennsylvania. Most of the Quakers came from England, but many others arrived from Ireland and Wales. At the juncture of the Delaware River and the Schuylkil River Penn established the city of Philadelphia.